Oakland, California. Transit Books. 2018. 225 pages. Far south of Buenos Aires lie the isolated steppes of Patagonia, Argentina’s southernmost region. For Argentines, Patagonia is considered a backwater dotted with occasional tourist attractions such as the Swiss-influenced ski town of Bariloche; foreigners may remember it as the endpoint of Paul Theroux’s train journey across South America. Today, the region is sparsely populated, and its few residents struggle to find work. 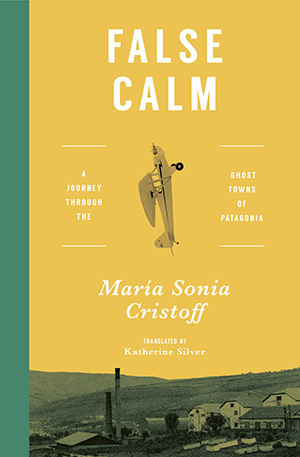 María Sonia Cristoff’s False Calm aims to tell the stories of the tiny, far-flung towns scattered throughout Patagonia through the eyes of their residents. Cristoff is herself a native of the region who left for the big city while still young; now, returning as a writer, she spends her time in these towns walking and waiting for their stories to reveal themselves, and sooner or later people begin talking. Cristoff journeys from one small town to the next, among them Santa Cruz, where the story of an amateur pilot is intertwined with the history of Patagonian aviation; Maquinchao, where she recounts the story of immigration to Argentina through the lens of the mysterious disappearance of early twentieth-century Arab merchants; and El Cuy, where superstition surrounding a shrine dedicated to a young boy governs the behavior of residents and visitors. The narrative is told from Cristoff’s point of view, and she is an active participant, often pausing to include her own experiences or to meditate on how one aspect or another of life on the steppe is related to a pop culture artifact or a work of literature. Yet at the same time, the different voices of the people she encounters stand out from one another, and although the book is written in a way that does not put her skills as an interviewer at the forefront, it’s clear that she has a gift for identifying interesting stories and eliciting meaningful detail from her subjects. False Calm is fascinating, informative, and ultimately a pleasure to read, due in large part to the fact that Cristoff seems to let her peregrinations and the stories of her subjects guide her book rather than setting out on a southbound bus journey with an agenda in mind. An interview with poet and spiritual teacher Alice Walker headlines the November 2018 issue of World Literature Today. The issue also devotes a special section of fiction and poetry to the theme of illness and literature. The Staunch Book Prize: Feminist Initiative or Not?